Phase Distortion is here to deliver phase melting mayhem! Traditionally, most distortion units overdrive and shape the amplitude of a signal in various ways to generate a rougher sound. Phase Distortion instead lets the signal modulate the phase of itself, essentially resulting in something similar to feedback FM. 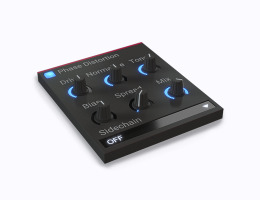 This way you can add that FM touch to any sound, to get a sweet 80's vibe or a filthy dubstep bass. Phase Distortion shines on its own, but it was primarily created to power up the different "Snapin Hosts" Kilohearts offer. These are bigger effects units that utilize all the available snapins and give you a really fun and creative workflow for combining them in any way you can think of. So have a look at Snap Heap and Multipass right now! This plugin is a "Snapin". That means you can use it as a regular AAX/VST/AU plug-in, or you can use it with the Snapin hosts Snap Heap and Multipass where you can combine effects in amazing ways.